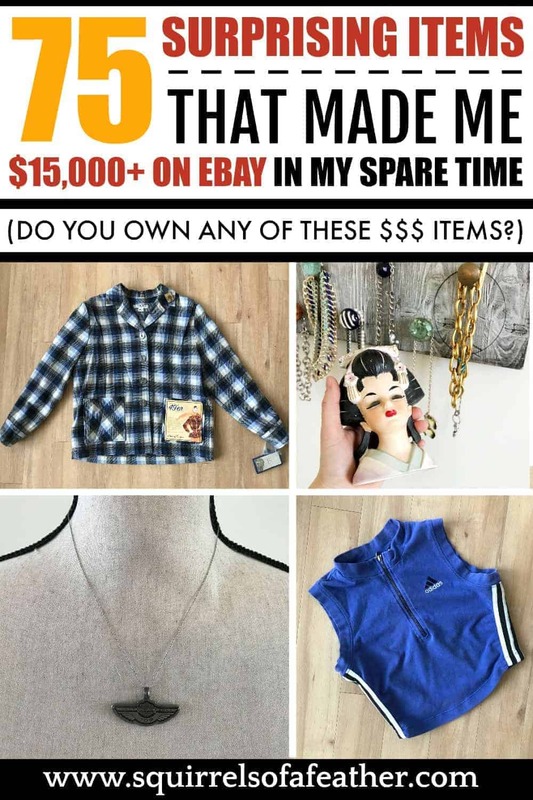 Are you interested in turning your household clutter into cold hard cash or make money thrift flipping, but not sure what items sell well on eBay? Got you covered! 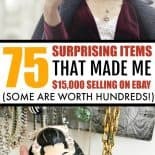 Check out this list with 75 surprising items that you can sell on eBay for high prices — some are worth hundreds! 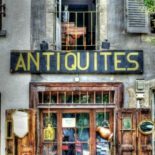 Start treasure hunting in your very own home today with this list of the best things to sell on eBay as a guide. 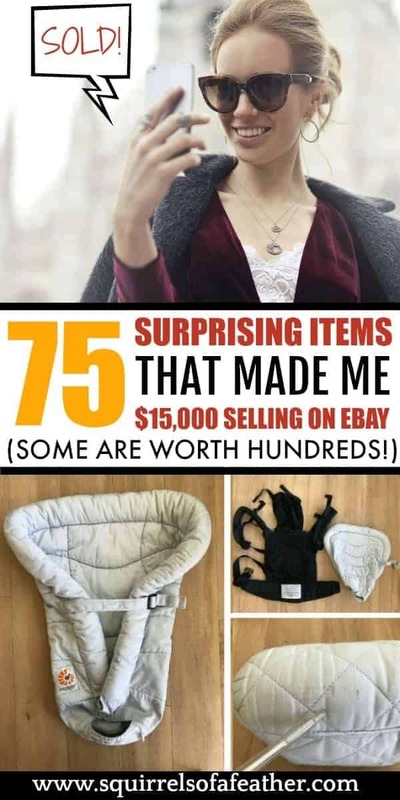 This list of the best things to sell on eBay has been built from personal experience selling on eBay and observing thousands of listings on that selling platform. Some of these items can be found for free and sold for pure profit; others are worth hundreds or even THOUSANDS on eBay. All for stuff you just have lying around your house or can find at your local thrift store. If you want to make more money on eBay, the Advanced Search feature is the most valuable tool you have in your eBay arsenal. It allows you to check Sold Prices for similar items so that you can see what other people (read, competitors) are charging for exact same things. Don’t try and sell something without first checking to see the value of the item on eBay (especially if you are thrift flipping for profit). Knowing the approximate value of the item you are selling will help in pricing it to sell fast for a tidy profit. Remember, always check items for their SOLD PRICE and not by current list prices. People could charge any price for anything on eBay if they want; that doesn’t mean it will sell! If something is not selling either the price is too high or that is not a desirable item. 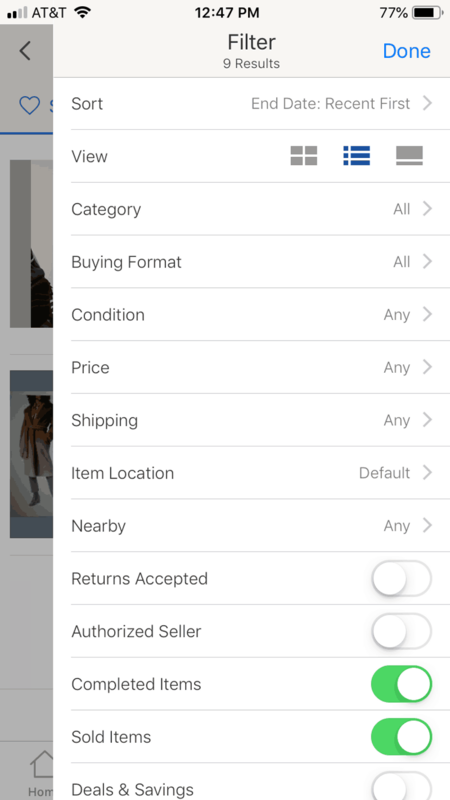 Whenever you are digging around your home searching for treasures or browsing secondhand items, have the eBay app open so you can quickly check recent sale prices for items you find! Look for prices in green and check the cha-ching! This list is SURPRISING things that sell well on eBay — I’m not going to go over things like iPhones, MacBooks, and Yeezy shoes because — duh — obviously, those things are going to sell well. Here are some of the best selling items on eBay that you can find laying around your home or easily at the thrift store! Items have been separated by category for your convenience. These are worth more if you have the original box, but can also be sold without — I have even successfully sold crystal figurines that were broken! Almost anything Disney sells well on eBay. If you have multiple items within a category (like a bunch of DVDs) it’s great to bundle them together. Barbies can be sold individually or in related lots, such as “Christmas Barbies” or “Gone with the Wind Barbies”. Even if you have Barbies with missing parts or in poor condition you can sell those as a lot — some people use them for arts and craft projects. Barbie clothing and accessories can be sold on eBay separately. Barbie shoes, purses, houses, cars, pets, hair care items, etc, it’s all sellable. Vintage Star Wars toys can be worth a lot, especially if they are still mint condition in the box. However, anything with a Star Wars theme can do well, like Star Wars lunch boxes. LEGO lots and collectible LEGOs (especially vintage LEGO sets that are still in the box) are great items to sell. If you can find unopened vintage LEGO sets you could be sitting on a gold mine. However, even assorted LEGOs can be sold, even in small lots. Pay attention to trending items and you can really make big money! At one point Hatchimals were being snapped up by resellers for Christmas for $79.99 at stores like Walmart and then being resold for $200-$500 on eBay! Trends come and go, so try to keep your eyes peeled for any opportunities to get on board. With the advent of shows like Stranger Things, vintage nostalgia is at an all-time high! Cash in by looking for retro and vintage items from the ’80s, ’90s, or even earlier! Board games can be pretty expensive. If you can find a vintage board game in good condition with all it’s pieces or new board games that are unopened those can be sold for good prices. Unopened vintage board games are probably worth the most. 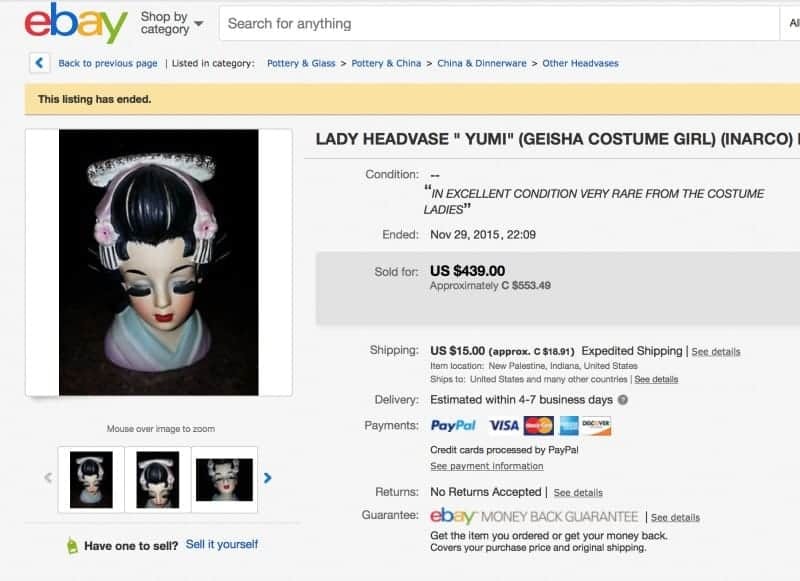 Popularized in the 1950s, ceramic head vases can go for HUNDREDS on eBay, especially if you have a beloved person or character (like Jackie O or Dorothy from the Wizard of Oz) or an ultra-rare head vase. One of my prized possessions is a head vase given to me by my grandmother. When I started selling on eBay, I decided to look her up, just to see what she is worth. Mine looks just like this one below. My grandma’s old head vase is worth $440!!! Can you believe it? High-end brands like West Elm and Better Homes and Gardens can sell for up to $50/plate, even in pre-owned condition with some wear. Also, pay attention to current trends because these items can often be snapped up and resold for higher prices (I am seeing this with brands like Rae Dunn, currently). Teacups seem to be worth either nothing or a lot. Check the makers stamp on the bottom of your teacups and compare to the ones online. I saw one teacup go for over $800! *Sips tea*. Not all Fenton or carnival glasses command high prices. Certain colors, collections, and sizes are worth more. Any damage will also reduce the price — watch out for chips or hairline fractures on these items, which can be hard to miss. People LOVE to look for deals on high-end cookware available for resale on eBay! For example, wannabe chefs can score this 5-Quart Le Creuset braiser for 1/3 to 1/2 price on eBay! Jadite is a highly desirable a radiation-green looking type glass and you can often find plates, bowls, saucers, and vases at thrift stores. While always popular with niche buyers, Jadite seems to be making a mainstream comeback recently thanks to Chip and Jo from Fixer Upper. I recently saw that they had some Jadite-style cups and other items for sale at Target for their Hearth and Hand line! 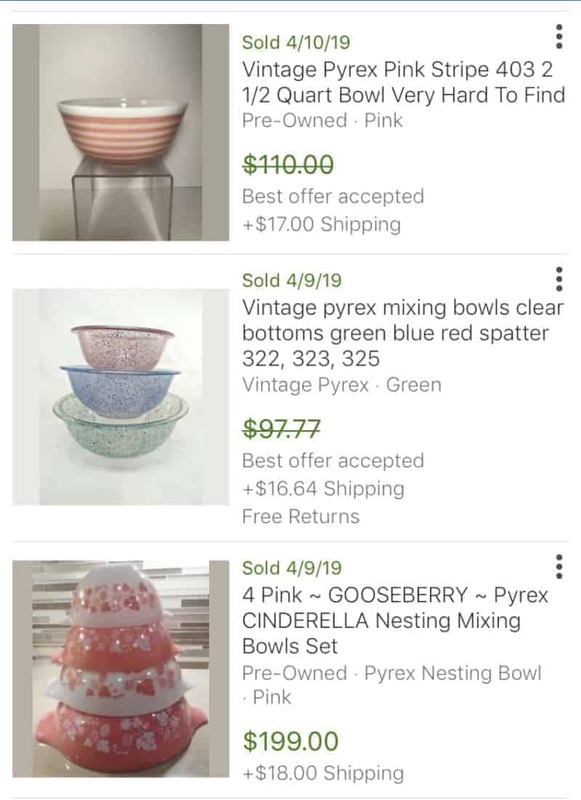 If you have some old Pyrex sets in good condition (especially certain colors like turquoise and pink or patterns like the atomic eye) you can sell them for a tidy profit. If you find them while thrifting, refer to competitor listings and make sure you aren’t missing any pieces, like a lid to a dish or bowl, which may reduce the expected price. Brand name clothing can sell well on eBay, depending on the time of the year and the brand. While new with tags items usually perform better, your item doesn’t necessarily need to be in perfect condition if it is highly desirable! If you don’t have highly desirable brands, even regular brands can be sold in bulk, like lots of Old Navy summer clothes in the same size. Both new and vintage name brand sportswear sell well on eBay. The condition is important; less visible wear is preferred. Lilly Pulitzer is a popular brand with women which produces colorful clothing and other wares, such as bedding and even picnic baskets! Name brand handbags in good condition, such as Coach, Louis Vuitton, Chanel, and Kate Spade to name a few, can go for hundreds or even thousands! Women’s and men’s suits do well, depending on the brand. I am more familiar with women’s suits and see a lot of Kay Unger, Talbots, Tahari, etc. New, used, and vintage dresses for prom, quinceañera, or weddings sell great! One of my best friends bought a Monique Lhuillier lace dress for her wedding from eBay for $1,500 — and she sold it after her wedding for the same price! Now that’s thrifty. Levi’s jeans are one of those niche things certain people seem to love. They are very popular in Europe — my husband said people in Germany went crazy for them when he was living there. Vintage Levi’s can go for over $100! Broken engagement? Unloved gift? Ring doesn’t fit anymore? Sell it! Since necklaces are very light in weight and can be shipped with minimal cost, nice necklaces, earrings, and other types of jewelry can be sold for a nice profit. Estate sales are especially great places to grab sweet deals on jewelry. You can also sell jewelry lots with random pieces as a “junk jewelry’ sale. If you have unwanted leather shoes, those can sell really quickly. Look for desirable brands with minimal wear — larger men’s sizes can sell particularly well because men with larger feet often have a hard time finding shoes that fit (look for wide sizes like EEE)! Start listing and selling clothing at least one season before — if you want to sell winter items on eBay, begin to list them towards the end of summer and early fall. Anything from snowboarding pants to anti-glare goggles to actual snowboards can be sold on eBay. Don’t forget to start a prior to snowboarding season! Frames, seats, handlebars, and wheels, almost all parts of a bicycle can be sold for a great price on eBay, if you have a high-quality bike. Almost every time I go to Goodwill I see vintage picnic baskets, which are quickly snapped up! 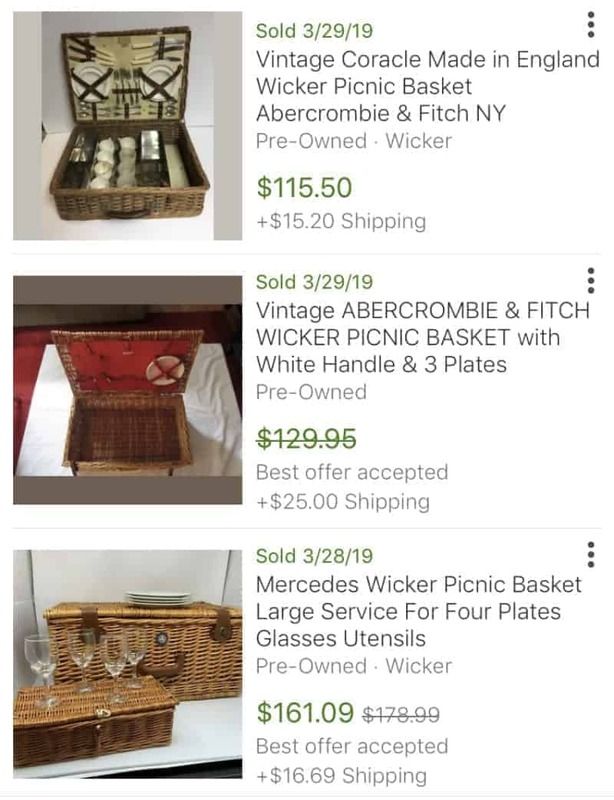 If you can find a wicker picnic basket with all the tableware and accessories still inside that can fetch a great price on eBay! If you had kids, chances are you probably have a Pack ‘n Play laying around somewhere (one of the most useful baby shower gifts I EVER received). A PNP can be broken down into parts and sold piece by piece for the same price as a brand new model! Infant sleep (or lack thereof) is a big deal for parents. If you have any Halo sleepsacks or Zipadee-zips laying around, sell them for a quick profit. Fertility monitors and accessories to track fertility are very, very expensive. 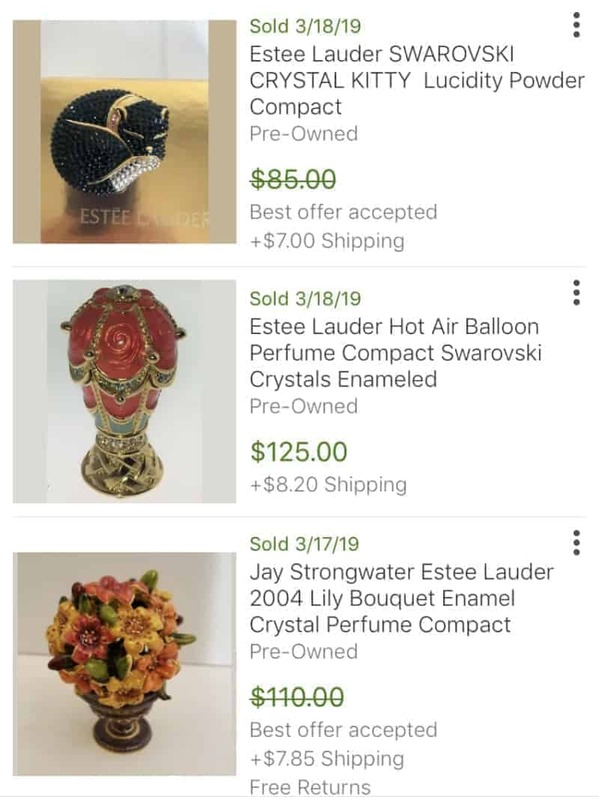 You can recoup some of that cost by reselling your fertility monitor, unused fertility monitor sticks, fertility bracelets, ovulation testers, and more on eBay! Even if you only have the base, you can make good money. Make sure that you know the manufacture date (should be somewhere on the car seat) because they have a limited shelf life (mine was a Chicco Keyfit 30, good for 8 years). Again, pretty much all moms have owned at least one (and sometimes many) types of wearable baby carriers (I had an organic Ergo). When you don’t need it anymore, sell it on eBay! Niche baby care items can also sell well. I had this pillow to help remediate my son’s plagiocephaly (flat head) and after he was finished using it, that used pillow went for $90 on eBay! I also sold some wedge-shaped pillows that were meant to be placed under mattresses to help children with reflux issues. If you have any specialty items that your children used and have outgrown they can be passed on to a new family for a good price. Not only more recent train sets like Thomas and Chuggington but also vintage toy trains can be sold on eBay. You don’t have to have the entire set either; people often buy replacement tracks and parts for items that get broken or lost. I converted my Ju-Ju-Be BFF diaper bag into a camera bag (you can pry it out of my cold, dead hands), but I could have just as easily sold it on eBay. 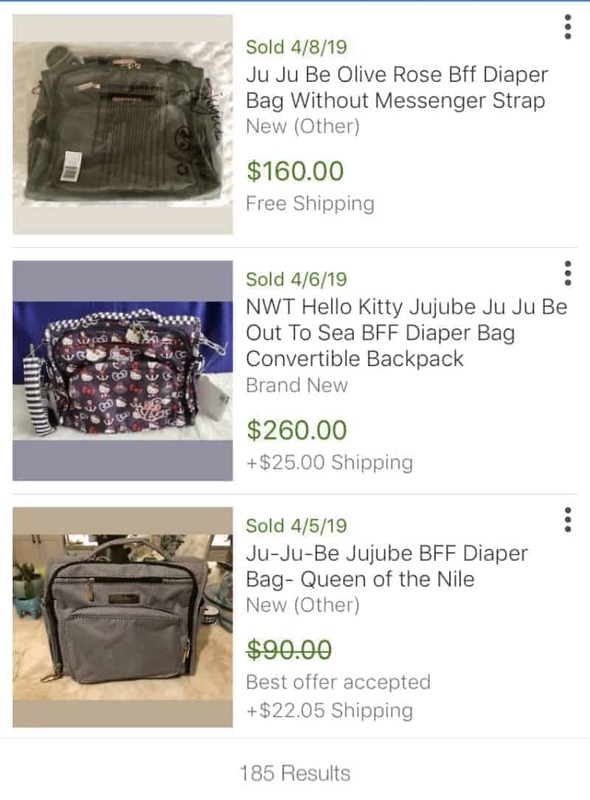 Brands like JuJuBe and Petunia Picklebottom sell very well on eBay, even if they are in used condition. Start selling your old mitts before or during baseball season and you can make a pretty penny. Vintage mitts can go for hundreds, depending on the brand and specific model. Take a look at the palm, the stitching, inside the mitt, etc to assess the quality and note the specific mitt type and use the eBay Advanced Search feature to try and look up the specific mitt on eBay. You can also check the maker’s website or run an online search. There are websites that specifically list different baseballs mitts by serial number to help people identify their value. Both new, used, and vintage golf shoes can be sold quickly for the right price. Try and clean any dirt, grass, or other debris off before photographing and selling. Jerseys, shot glasses, bobbleheads, all sorts of team collectibles can be resold on eBay. If you got a new phone because your old one broke you can sell your broken phone! Some people buy broken phones specifically to flip. Just BE SAFE and wipe your phone of all data before selling! Because phones are so expensive nowadays there is a big market for replacement phone parts and accessories, like cords. Protective phone and iPad cases, like Otterbox, can sell well, even in used condition. If you are a lucky soul that has an original, working Atari or Nintendo, there is a great market out there for that. Video game controllers can get expensive so if you have any extras lying around they can be sold on eBay for a decent amount. Cameras and camera accessories are very expensive; a lens alone can cost hundreds or thousands of dollars. People like to watch out for deals on costly camera equipment like Nikon and Canon DSLRs so they don’t have to pay full price. While you can buy new Polaroid camera models now online, vintage Polaroids and Polaroid film can also be sold on eBay. 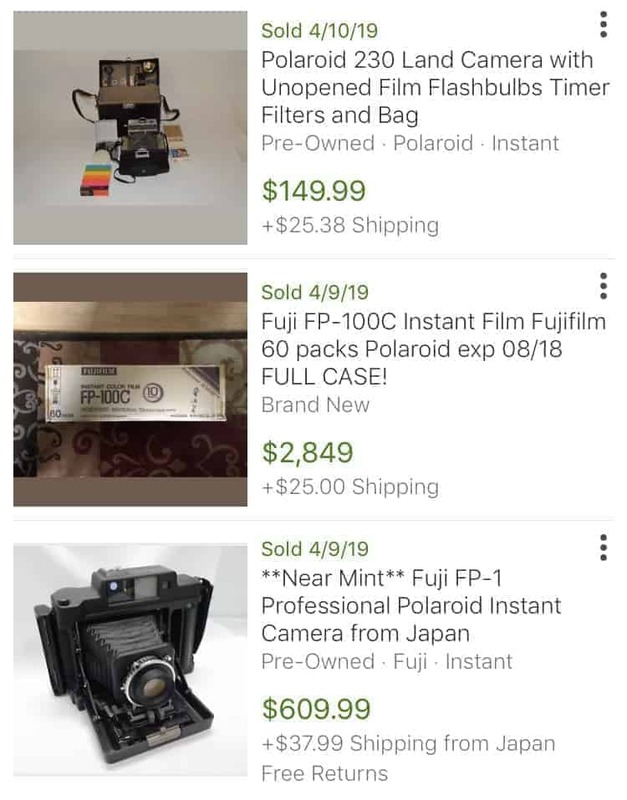 Check out how much someone paid for that that Polaroid film below! As long as you have more than 90% of a desirable type of perfume or cologne, you can sell it! Highly valued and discontinued perfumes can go for even more, and people might even still be will to buy if it’s 50% full or less. If you have some MAC eyeshadows or Estee Lauder lipsticks you have never used, turn those into cash in a heartbeat. Makeup brushes can also be sold on eBay. MAC is one type of brush that seems to be consistantly in high demand on eBay. Colorful, vintage, or high-ticket items like MAC, Christian Dior, Guerlain, and more can sell even if the containers are empty! Makeup or makeup accessories that are sold as part of a “special edition” series can be sold for high prices! I once sold an empty Estee Lauder compact that was covered in Swarovski crystals for over $60! Yes, you can sell entire cars and motorcycles on eBay. Buyers may even be willing to drive long distances to acquire specialty vehicles or antiques. Anything from replacement seats to engine parts can be sold on eBay. People who buy cars as donors for cars they are trying to update can break down the entire car into parts to resell on eBay. I don’t get it, but bike wheels go for tons. Make sure you know the specific brand, size, etc. Same idea as the PNP, if you have a defunct vacuum or upgraded to a new vacuum recently, that old vacuum is worth more in parts than it would be to sell as a whole. Not my thing, but these seem to do well on eBay. I know a guy whose dad had boxes and boxes of these! Crafters love to buy crayons in bulk to melt down and make all sorts of different projects. Also used for various crafts. Vroom vroom! Power tools and power tool accessories, like drill bits, can all be sold on eBay. If you have a lot of gold or silver items, you can also sell them by the oz on eBay. If you have discontinued items you might be sitting on a goldmine. Even food items that have been discontinued can sell for a pretty penny. The McDonald’s Szechuan sauce was trending a while back because of a Rick and Moriarty episode! Large pine cones sell great on eBay, especially during the holidays. Crafters and home decor pros love pinecones for DIY projects and home decor, the bigger the better! Since you can find pinecones for free this item is pure profit. Like pinecones, wine corks are popular for all kinds of crafts, like cork boards or kitchen chargers. Keep your eyes peeled all year round for ugly or funky Christmas sweaters because these babies sell like hotcakes for the holidays. Tons of people specifically buy ugly sweaters to get a laugh out of their pals at Christmas bashes. Look for tons of sequins, crazy knits, and lots of personality. List for sale well before Christmas, even as early as Halloween. People who want to learn another language (or give their children toys to help them their native language) will appreciate the opportunity to buy cool products in a different language, like foreign language books, newspapers, toys, music, and more. No joke, these items that you get for free when traveling by plane can be sold on eBay! 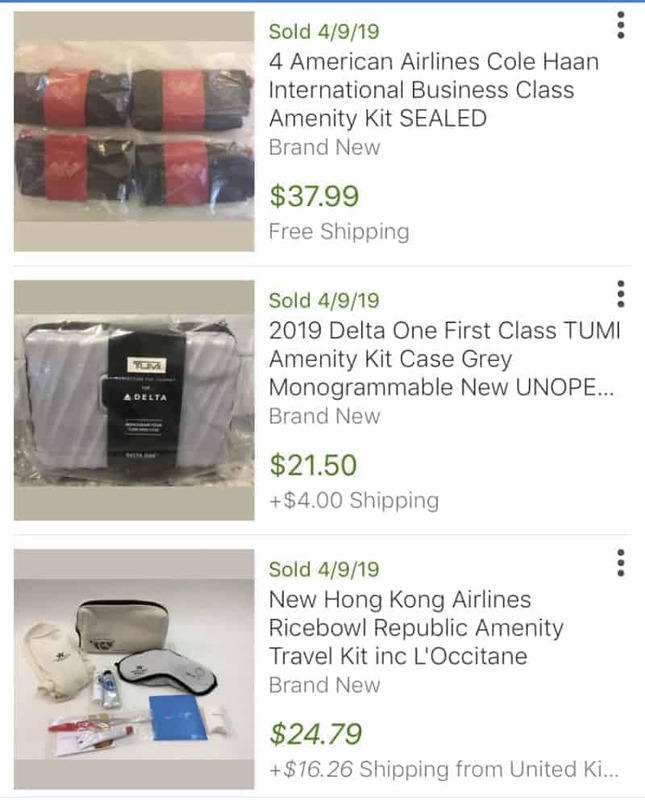 The biggest profit will be for First and Business Class kits, especially names like United Polaris or Delta Tumi, but you can also sell lots of amenity kits for a decent price. It can be hard to make decent money with individual books on eBay, as the market is saturated — unless you have high-demand, antique, rare, or signed books. However, if you have a group of many similar books, like Stephen King horror novels, the Harry Potter complete series, or even vegan cookbooks, your listing could do very well. I have also sold manga lots (Japanese comics), books related to Montessori-style teaching, etc. With books, take care to note any wear or damage. Common book wear includes wear marks on the spines, bleaching of the cover due to sun exposure, or missing pages. Old textbooks often fetch a high price; if you are a student, it’s better to sell them right after waiting many years (like I did), as the price tends to lower as new editions are published. However, if you can find vintage textbooks from decades past those might also command high prices! Instruction manuals are easy to lose or misplace. If you have instruction manuals for cars or appliances that you don’t need anymore you can sell them on eBay. If you are someone who goes through a lot of packaging, newspapers, mail, and catalogs you can collect Box Tops for Education and coupons and sell those online! There you have it! A list of 75 items you can sell on eBay. But don’t stop there…there are many, many more things that people want to pay you good money for! Take a look around your house and see what unwanted items you have that could be turned to cash. Sign up at eBay.com so you can start making money on eBay today! Want to start selling but you feel like you need more information? 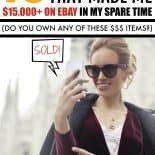 Check out this post with all my best tips and hacks for selling on eBay that got me to $1,000+/month in my spare time! Decluttr App: How Much Money Can You Really Make? Sign up to get your FREE printable eBay checklist today! Sign up for our newsletter and get access to our Resource Library, an exclusive space for members to stay in touch with up-to-date easy recipes, fun DIY projects, helpful organization tips, and creative side hustles for creating extra income — all so you can build the balanced lifestyle of your dreams! Enter your information in the subscription box below and get access so you can print your “thank you” freebies today! Wow, that is quite the list. I might even have a few of those things laying around. This is awesome for those who need to get rid of somethings and don’t want to throw away or donate. And the best part is that they can make some money from it. This is an AMAZING list! Your posts are always so helpful, Marissa… I can’t believe that vase is worth $550… So fun to find out things like that! I know, right??? So shocking! You never know the treasure you have laying around. great list and yes, head vases are truly worth a lot I try to pick them up whenever possible.